Fireplaces. 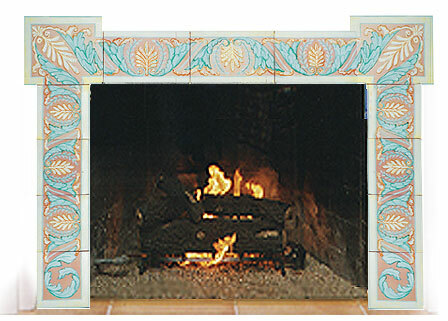 Fireplace Surround Tiles of Terra Cotta Hand Painted by Tile Artist Bettina Elsner. 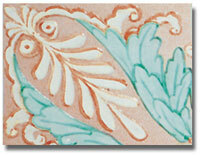 Picture the beautiful Fireplace Surround below made of Hand Painted Terracotta Tile by Bettina Elsner in your Home. We can Custom Design a Fireplace Surround for you in any Size or Color Combination, and we have many Style Patterns available for you to choose from. We can even offer you a Custom Terra Cotta Floor Tile Rug and Table to match. Just Contact us for a free Consultation. You Deserve the unique Fireplace Artistry that is Bettina Elsner Artistic Tiles. All ELSNER TERRA-COTTA Series, Borders, and Floor Tiles are made to order and can be customized to fit your colors and project parameters. CONTACT us with your Project TODAY. We will make your project a complete success. To find out more go to our Order Center.